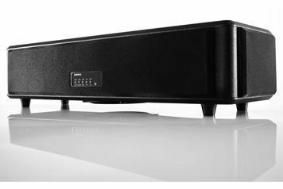 Lenco launches the SB-100 '3D sound bar' | What Hi-Fi? The SB-100 sound bar uses Sonic Emotion's 3D sound technology to create the illusion of surround sound without the need, naturally, for the 5.1 speaker set-up. Inside the sound bar you'll find six 10-watt speakers and a 20-watt subwoofer, giving the unit a total output of 80 watts. The device has two line inputs and an auxiliary input but no sign of any digital connections.